Google have came with a new app and this time it's Google Payments App named Tez. Using Tez App, you can make UPI Payments to your friends or shops directly from your bank account. It’s totally secure payment app and since it’s by Google, you can definitely trust it. Here is a Promotional offer by Tez App where you can earn ₹51.Get ₹51 in your Bank Account instantly on Joining and ₹51 for every successful referral done by you. 4. Now verify your mobile number through OTP, then write your email address. 5.Now you will have to Add your Bank account. Just click on ADD BANK ACCOUNT Option. The app will automatically detect bank account linked to your mobile number,if not select your bank manually. Just select the Bank and Enter the UPI Pin,if you don't have a UPI Pin just create one from the app itself. 6.Now your Bank account is linked to the app UPI successfully. 7.Now proceed to the Payment. You have to do a transaction to get the Joining Reward. So you have to just Send ₹1 to do the first transaction and get ₹51 as joining reward. 8.Select any Contact to Send ₹1. If you don't have any Tez contact then you can type 7002264515 to send us. NOTE: We will give it back to you. 9. 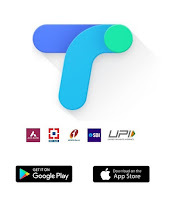 Send ₹1 through UPI/Mobile No./Bank IFSC NO/QR CODE (Bank account which you just linked) from the Tez app. 10.As soon as you successfully send money (or complete the first transaction), you will get ₹51 Cashback which will be credited directly to your bank account. 11.Your Joining Reward of ₹51 will be directly credited to your Bank account. Refer friends to Google Tez App and Earn up to ₹9000 . For every successful referral, you will get ₹51 directly to your bank account and your friends will also get ₹51 as Joining Reward once they complete their first transaction. 2.Scroll down and click on offers button. 3.You will see Tez Referral offer. Click on it. 4.Copy and Share your Tez App Referral link with your friends or via social media. 5.Ask them to join Tez using your link and do the first transaction. 6.They will get ₹51 as Joining Reward and you will get ₹51 for every successful referral. 2.Invite anyone to Tez and both will get ₹51 when your referral makes their first payment via Tez app. 3.Your friend must sign up through your unique Tez Invite Link. 4.Your referral must successfully complete a payment using Tez App. We have already wrote about Google Tez's Refer & Earn Reward , Where you can get ₹51 in bank by sending ₹1. 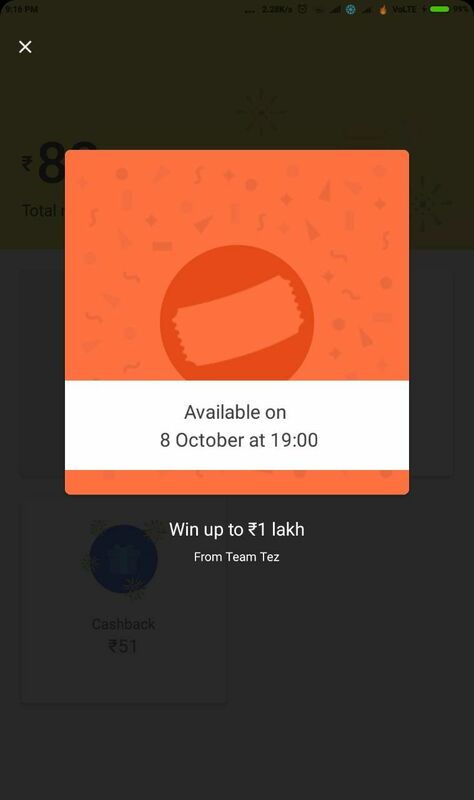 Google Tez is giving away SCRATCH CARD when you send ₹150 or more to other Google Tez user. 1.After above refer & earn steps follow below steps. 2.Select any Contact to Send ₹1. 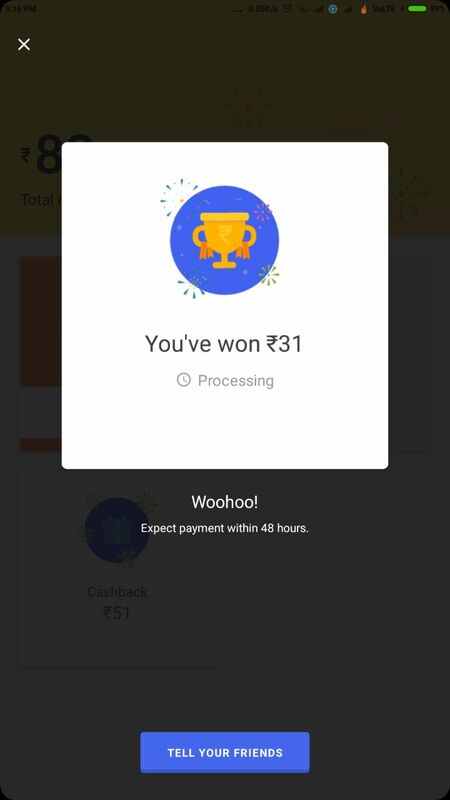 5.Enjoy the rewards from Google Tez!! Note-You can win upto 5 Scratch Cards in a week. Proof : I have Won ₹31 from Scratch Card ,you can win upto ₹1000. You'll get a chance to win ₹1 lakh if you pay anyone ₹500 or above per week. You'll be automatically entered to win. 1.You must successfully send ₹500 or more to another Tez user. 2.Payment sent to a non-Tez UPI ID do not qualify for this offer. 3. Each sender can earn one reward each per week and for each reward you can earn, you have a chance to win ₹1,00,000.